The accreditation bodies that are signatories to the ILAC MRA have been peer evaluated in accordance with the requirements of ISO/IEC 17011 to assess and accredit conformity assessment bodies according to the relevant international standards, including calibration laboratories using ISO/IEC 17025, testing laboratories using ISO/IEC 17025, medical testing laboratories using ISO 15189 and inspection bodies using ISO/IEC 17020. The accreditation bodies that are signatories to the ILAC MRA for the relevant accreditation activities will accept the results of each other’s accredited laboratories and inspection bodies. Therefore, the results from the laboratories and inspection bodies accredited by the ILAC MRA signatories are able to be recognised internationally under the ILAC MRA. The accreditation bodies are responsible for maintaining a list of laboratories and inspection bodies that they have accredited. The ILAC MRA Signatory Search provides the contact details for all the accreditation bodies that are signatories to the ILAC MRA and this list is searchable by organisation name, economy and accreditation scope. 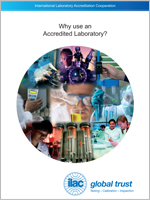 In many cases, a link to the accreditation body’s online directory of accredited laboratories and inspection bodies is also provided with the accreditation body’s contact details in the ILAC MRA Signatory Search. Accreditation bodies issue accreditation certificates that include the accredited laboratory or inspection body’s scope of accreditation. Accreditation bodies that are signatories to the ILAC MRA are able to use the ILAC MRA Mark in combination with the ILAC MRA signatory logo, i.e. the “Combined ILAC MRA Mark”, for accreditation activities covered by the scope of their ILAC MRA signatory status. Accredited laboratories and inspection bodies issue calibration, test or inspection reports that include the results as well as information on the standards and methods used. The accredited laboratories and inspection bodies of the ILAC MRA signatories are able to use the ILAC MRA Mark in combination with the ILAC MRA signatory’s accreditation symbol that the accredited conformity assessment body (CAB) is entitled to use, i.e. the “Accredited CAB Combined ILAC MRA Mark”. ILAC R7 Rules for the Use of the ILAC MRA Mark is available from the Publications and Resources section. In order to check the validity of a certificate or report, it is best to directly contact the accreditation body that is a signatory to the ILAC MRA for the relevant accreditation activities in the economy where the laboratory or inspection body is based. The accreditation body will be able to confirm the laboratory or inspection body’s accreditation status and their scope of accreditation. If you have received a counterfeit certificate or fraudulent report, then please contact the accreditation body that is a signatory to the ILAC MRA in the economy where the certificate or report was issued. 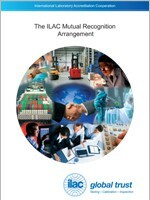 The ILAC Mutual Recognition Arrangement Why use an Accredited Laboratory? 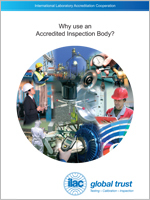 Why use an Accredited Inspection Body?